You can set up your gmail.com account in order to use it as an email client to send and receive messages from a different email address. 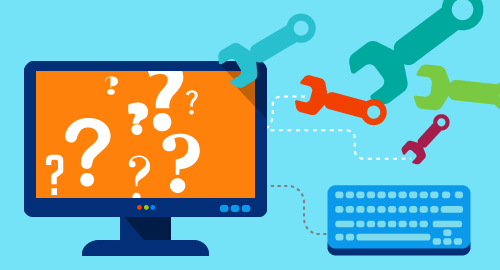 Password: the email account password (not displayed anywhere as you can change it in cPanel » Emal Accounts » Password and Authentication). 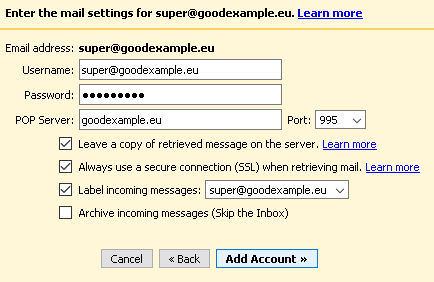 Settings for adding an email address can be accessed in gmail.com (mail.google.com) under » Settings » Accounts and Import » Check mail from other accounts » Add a mail account. 1) Enter the full email address (myemail@mysupersite.com) and click Next. 2) Select Import emails from my other account (POP3) and click Next. Check "Leave a copy of retrieved message on the server." (So that copies of the retrieved messages are left on the server. Otherwise all messages will be available only in your gmail account as you will not be able to view them if you check your еmail from another email client). Check "Always use a secure connection (SSL) when retrieving mail." Check "Label incoming messages:" and select how to label the incoming messages on this email address so that you can easily distinguish them from the @gmail account incoming messages. Continue the setup by clicking Add Account. 4) Select "Yes, I want to be able to send mail as myemail@mysupersite.com" if you wish to and click Next. 5) Enter the name to be displayed for the messages sent from this address and click Next Step. 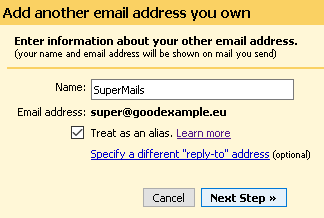 Leave the option "Treat as an alias" checked if you would like to send and receive messages for this Gmail address. If you would like only to send messages from another user/email address without receiving messages for this address uncheck this option. More information on this option is available on the official help page: Should I uncheck "Treat as an alias" in Gmail?. 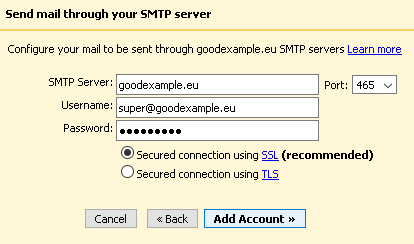 Select "Secured connection using SSL (recommended)"
7) Confirm adding this email address by clicking the link in the email you will receive and enter the code received in the gmail form. After you confirm adding the email address in Gmail you will be able to send emails by selecting the identity for the added email address from the drop-down menu From in the window for writing a message.